rec. 1969 (5), 1971 (3), 1974 (9,Egmont), 1975 (6,7), 1976 (1,2,4,8); no locations given. ADD/AAD? Hungary produced a bumper crop of émigré conductors last century. From 1953 to 1963, three of the top five US orchestras had a Hungarian on the podium, with Fritz Reiner in Chicago, George Szell in Cleveland and Eugene Ormandy in Philadelphia. While Reiner's death in 1963 ended this Hungarian dominance briefly, it was restored for a year when Georg Solti took the reins in Chicago in 1969. Szell died the following year (1970) and was replaced at the helm of the Cleveland Orchestra by Pierre Boulez. Solti and Ormandy, though, remained in charge of the Chicago and Philadelphia orchestras until 1991 and 1980 respectively. Meanwhile, between recording sessions in London and on the continent, Antal Doráti spent 35 years building and rebuilding orchestras in Dallas, Minnesota, Stockholm, Washington, London and Detroit. János Ferencsik, who was born in 1907 and died in 1984, was an almost exact contemporary of Doráti. Unlike Doráti and the other Hungarian maestros mentioned above, Ferencsik stayed in Hungary after the Second World War and remained even after the brutal repression of the 1956 rising that saw another Hungarian maestro, Istvan Kertész, flee to the West. Ferencsik felt that his place was in his own country and that music was a consolation and a voice that he could offer his people. 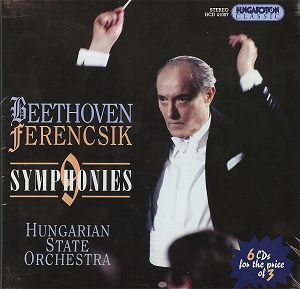 The booklet notes recount that Ferencsik selected an all Beethoven programme for the Hungarian State Orchestra’s first concert after the 1956 rising. It opened with the politically-charged Egmont Overture, which had been frequently heard on radio during the rising. The violin concerto followed, and the concert closed with the Eroica. As the funeral march began, the entire audience of 1,000 people “stood up and listened motionless … According to recollections of the still alive members of the orchestra, Ferencsik did not state his reason for choosing this concert programme … but everybody knew that it was a kind of commemoration and demonstration”. Ferencsik was a noted interpreter of the music of his contemporary countrymen, Bartók and Kodály, but the Austro-German classics, and in particular Beethoven’s orchestral works, were central to his repertory. This is to be expected, given that he saw himself as the heir to the conducting tradition of Furtwängler, Klemperer and Toscanini. His approach to Beethoven sits broadly within that tradition, but is individual. He does not follow Furtwängler in drawing a big bottom-up sonority from his orchestra and is not emotionally involved with the same degree of impetuosity. He chooses tempi that sometimes approach Klemperer’s and believes in bringing the winds to the fore as Klemperer did, but his concern is not so much for the overall architecture as for balancing of parts. A disciple of Toscanini would be expected to hit the notes hard and fast, but he eschews the Italian’s drive. He does share his concern for exact note values though – there is a tenuto quality to the playing throughout this set. As a general comment across the cycle, Ferencsik coaxes some wonderfully balanced sonorities from his orchestra and brings out detail in the more lyrical passages with an affectionate warmth. Beethoven’s more dynamic writing, though, often fails to catch fire, though I wonder to what extent this is due to Ferencsik’s preferred tempi and to what extent it is a product of the orchestra’s limitations. The Hungarian State Orchestra is not a bad band. Its wind soloists have plenty of character and the horns are sensitive, but the strings – in particular the violins – are frequently plagued by flawed intonation. The sound quality of the recordings is also variable. Before taking each of the symphonies in turn, I note that the performance of the Egmont Overture, the only filler offered with this Beethoven symphony cycle, is impressive and showcases everything that is good about Ferencsik’s Beethoven. The introduction is powerful, built on the strings’ tight tenuto phrasing and the plangent quality of the winds. Ferencsik gives a lyrical characterisation to the passage leading into the allegro, with gentle rubato taking the place of building tension. The allegro emerges from this passage in an understated fashion, but builds quickly in drama and power to a rousing conclusion. The balancing of parts here is impressive; even more so the balancing of the lyrical and the dramatic. The orchestra sounds great too, with the timpani ringing out and the strings united in attack. These elements come together in places in the symphonies, but not consistently. The first symphony receives a charming performance, but one that reminds me more than any other of Berlioz’s comment on this score: “Beethoven is not here. We are yet to meet him”. A slow, dreamily teasing introduction leads into a genial account of the first movement, which sounds more Mozartian than ever. The second movement comes across more like old fashioned Haydn. I like the way Ferencsik gives this movement a bit of a ländler feel by leaning into the first beat of each bar. The third movement fails to gambol as it should, though the central trio is lovely. The finale, again sounding overly Mozartian here, is underpowered and misses the Haydnesque humour that Beethoven, at this stage in his career, was so eager to emulate. Overall this is a pleasant reading, with some passages of lovely detail, but it is too soft around the edges to make an enduring impact. The tuning in the violins goes awry about 2:20 into the third movement and remains problematic for the rest of the performance. The sound picture is decent, with a nice bloom to the strings, though the timpani sound like they are in the next room. Ferencsik's recording of the second symphony is less successful. The first movement starts gingerly and while it does perk up, the structure feels loose and there is an overall lack of tension and refinement in the string tone. The strings sound much better in the affectionately shaped second movement, which has a charming lilt and features some lovely clarinet playing. The tempo remains stately, but the long lines are carefully phrased and the balancing of parts is well thought out. Still, the violins’ scratchy timbre takes the sheen off what would otherwise be a lovely performance. The third movement is mildly perky, but we are sipping tea when we ordered coffee. The finale is similarly loose of limb. The problem with these two movements derives not from Ferencsik’s deliberate tempi, but from the slack articulation that makes them feel slower than they actually are. All up, this is a rather pedestrian effort, despite moments of lyrical bliss. The third symphony, while better than the second, is still disappointing. Ferencsik’s Eroica is a traditional, comfortable reading of broad tempi, and he is unable to maintain the tension of the first movement. There is little in the way of tragedy here, and Beethoven's powerful discords and troubled trudge lack impact. The second movement fares much better. Again the tempo is broad, and accents do not really bite as they might, but the overall conception is tighter and the mood of despair is well captured. The sweetness of the horn playing in the third movement is remarkable, but little else is. The finale moves at roughly the right pace but feels lightweight. The recording is clean and warm, but light in the bass, and tends to spotlight instruments, including a pair of rather droopy sounding trumpets about ten minutes into the second movement. Things improve in the fourth symphony. As with the first two symphonies, the recorded sound is a bit cloudy in the lower registers and the timpani sound mushy, but this cannot obscure a genuinely enjoyable performance. A mysterious pianissimo introduction leads into a joyfully lilting but stately allegro. If this first movement does not does not quite convey the feeling of Beethoven's vivace tempo marking, the exquisite woodwind interplay and glorious string phrasing offer ample compensation. There is an effortless charm to the genially paced and phrased second movement. The menuetto that follows is just as amiable, though here the effect is to smooth over the humour in Beethoven’s cleverly displaced accents. The finale burbles away joyfully with carefully graded dynamic contrasts and beautiful blending of parts. This is one of the better performances in the cycle, and a little more rhythmic verve would have made it more recommendable still. Ferencsik's fifth symphony is also quite enjoyable for the most part. As would be expected, given the comments made in relation to the first four symphonies, this is not a Kleiberesque take-no-prisoners reading, but one that balances drama with austere beauty. The first movement is not lightning quick, but sharp articulation and concentration from podium and players maintains the tension. Despite tuning problems, Ferencsik's balancing of parts, attention to dynamics and ability to contrast the lyrical with the darkly dramatic make this reading a success. The flexible second movement is genuinely beautiful here, but Ferencsik perhaps lingers a little too much, and the tension dissipates somewhat. There is mystery in the opening of the third movement and the horns project well though without a hint of violence. The build up into the finale is well managed. Only the finale itself really disappoints, as Ferencsik's generally fine conception is marred by untidy, unbalanced ensemble and poor tuning. The recorded sound, which generally scrubs up quite well in this earliest of the recordings here assembled, becomes ragged in the finale, unable to cope with the weight of sound. Ferencsik's account of Beethoven's sixth symphony is generally well played, despite some suspect tuning in the violins above the stave in the finale, and glows from within with a sunny warmth. His pacing is apt throughout and the forward balancing of the woodwinds adds to the bucolic feel - the bird calls by the brook are just lovely. There is some deliberately odd displacement of phrase endings in the second movement, and an exaggerated ritardando at its close, but the third movement flows and builds beautifully. The storm is a flashing sun shower, and the skies clear quickly for a merry close. The seventh symphony is better again: this is a reading almost on par with Ferencsik's fourth. The sound, as in the Pastoral, is better than it is elsewhere in this cycle though it remains light in the bass. Even better, the tuning of the violins is more secure. Ferencsik projects the introduction confidently, taking a broad tempo and drawing some lovely sounds from his winds above teasingly slow ascending strings. The main allegro charms with perky string interplay and a dancing solo flute. If it fails to become exuberant, it is enjoyable nevertheless. The second movement contrasts nicely: the orchestra sinks to a real pianissimo, and the broad tenuto of the strings marks out a funereal tread to rival that of the Eroica's second movement. A pleasing rather than exciting third movement follows, but the balancing if parts between strings, horns and trumpet in the trio is superb. The finale is taken at a moderate tempo, and although ensemble is not as tight as would be ideal, it brings the symphony to a bright conclusion. The eighth symphony was recorded a year later than the seventh, but the sonic picture has less body. It is also not as strong a reading, with fallible violins contributing to a performance lacking in tension. In the first movement, parts are well balanced and there is a beautifully blended passage of woodwind playing at around the 8:40 mark. Still, while the lyrical passages emerge fresh, the dramatic material is little laboured and the movement lacks the impetus that should power it from within. The second movement is bright, but let down by those violins. In the third movement it is the tuning of the winds that disappoints, though there are moments of beauty including some lovely blended pianissimo horn playing. The finale, which fails to sparkle, brings an unimpressive performance to a close. After the disappointing eighth, Ferencsik's cycle ends on a high with a grave but humane account of the ninth symphony. He shapes each phrase in the first movement with care and respect, maintaining a steady but flowing tempo. The build up into the movement's coda is impressive. The scherzo is nicely pointed, with the timpani and lower winds cutting through the textures clearly and fine contributions from the trumpets and horns. Ferencsik's dynamic control here is a vital ingredient in the success of this second movement, which is taken at a measured tempo. The gently lilting and gorgeously phrased adagio is at the heart of this performance, and for once in this set the strings impress, as do the horns – listen to the solo horn just before the eight minute mark for a moment of magic. Elsewhere the blending of winds and lower strings is gorgeous. The eruption that opens the final movement is a little weak, and whimpers away before the cellos and basses enter. The echoes of the first three movements that punctuate their recitative are ghostly. The first statement of the chorale theme is a bare whisper that Ferencsik coaxes into bloom slowly and gently. The soloists are of variable quality and, .like the chorus, are balanced quite close. Sándor Sólyom-Nagy’s bright baritone is attractively conciliatory, but the tenor does not balance up in the quartet singing and his drinking song, which is as stodgy as a dumpling, echoes with reverberation. The soprano brings a Queen of the Night feel to her part and generally she and her mezzo companion blend well with their male counterparts. The chorus sings with a passion that compensates for minor blemishes and complements the orchestra’s committed playing. Overall, this is a fine, glowing performance that, while neither highly dramatic nor deeply moving, is satisfying on its own terms. Hungaroton's space saving slim cardboard box is definitely a packaging plus, but within you will find each disc in a sealed white paper envelope with a clear plastic window. You have to try not to get adhesive gum on the CDs when taking them out of, and putting them back into, these no-frills envelopes. I suppose this packaging may keep costs down, but even Brilliant Classics manages to produce durable cardboard sleeves that don't risk disc stickiness. The booklet features a brief biographical note on Ferencsik in Hungarian, French, German and reasonable though slightly quirky English. There is also a little confusion as to whether the remastering of these recordings is ADD (as per the booklet) or AAD (as per the discs themselves). The fact that the booklet does not discuss Beethoven’s symphonies in any detail seems to indicate that Hungaroton is aiming this set at seasoned Beethovenians and those with an interest in the conductor. While much of the playing and conducting on this set is merely good or adequate without attaining the heights of greatness, there are moments – indeed whole movements – of inspiration here that will reward collectors in those two categories. Beginners and those still rounding out their appreciation of these symphonies will do better elsewhere. Karl Böhm's cycle with the Vienna Philharmonic, for example, comes from the same era and a similar interpretative viewpoint, but is better played and recorded (Deutsche Grammophon Australian Eloquence: 4631942-4631992).